Sometimes it is the simplest things that make me happy. 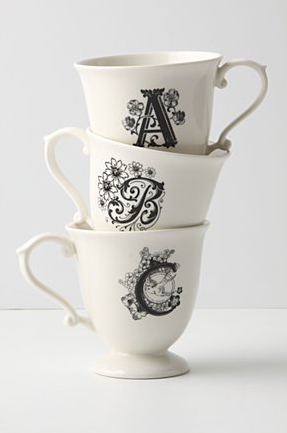 Like these porcelain monogrammed mugs from Anthropologie. Aren’t they adorable? I bought the “L” mug recently. Mornings with a hot beverage feel like a special time in my day. Before all the chores and To Do’s, I sit on a stool in the kitchen, quietly sipping a mug of hot coffee in a moment of peace.